FARMERS HEN HOUSE is family owned and has been operated by the Miller family since 2000. We manage small, family farms – most within 30 miles of our processing facility. Almost all are owned by Amish and Mennonite farmers. Their businesses are family affairs and many harvest their eggs by hand.Farmers Hen House is proud of the way our hens are raised. Our organic free-range and pasture-raised organic hens are free range. In addition to having cage-less, open barns, our hens flow between the indoors and the outdoors. When outside, hens roam grassy pens with plenty of room to be chickens! Organic Free-Range hens are guaranteed 2 sq. ft./bird while outdoors, and, for our Pasture-Raised organic hens, they are guaranteed 108 sq. ft./bird when outdoors. Never confined: Our hens are never confined or placed in cages. Our barns have perches, privacy nests, dust bathing and scratching areas. Certified humane raised and handled farms. Animal welfare is of upmost concern and we certify our farms annually with the Humane Farm Animal Care program. 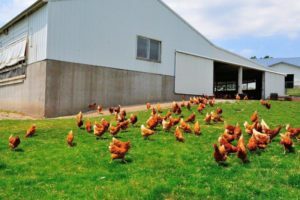 Along with annual inspections, Farmers Hen House maintains a compliance officer to ensure our farmers are on track with the USDA organic certification program and the Certified Humane program. Handled by environmentally responsible farmers. Raising organic hens begins with a commitment to organic farming. Organic agriculture results in healthy, chemical-free soil. Many farms in our area are passed down from generation to generation and it is rewarding to support and maintain family farming practices and not support factory farms. Pasture-Raised organic hens have more land designated as outdoor access in order to provide additional square footage per bird. Good for the bird, good for the land, and great for you! 108 sq. ft./bird!Fed a 100 percent organic non-GMO diet. In fact, many of our farmers grow the grains right on their own farms. No genetic engineering! Our chicks are born and raised organic. Our farmers do not plant bioengineered seeds!